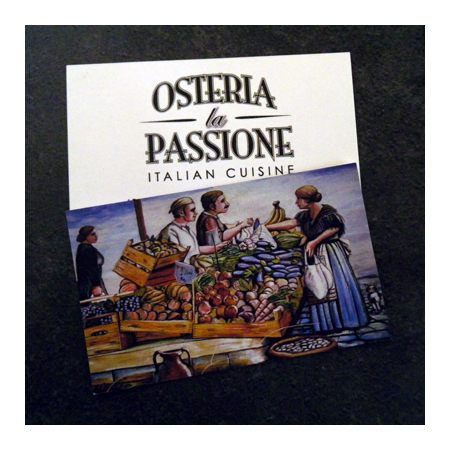 Just before Christmas, Osteria La Passione opened in Richmond. The chef is Carmine Costantini who previously worked at the Tea Rooms of Yarck. This is an Italian eatery with a difference - there's no menu and you are basically offered whatever the chef has cooked up for that day - note that they will ask if you have any dietary conditions and cater accordingly. There is a minimum of 6 courses for $75, though you can enjoy extra courses but it will naturally cost you more. At the moment it is BYO as they await a liquor license. The first dish which I didn't photograph was a piece of balsamic bread (bread made in house with balsamic vinegar) and cured olives. Still warm with a beautiful crust and a definite taste of balsamic, this first bite brought a knowing smile to our faces. Beautiful discs of perfectly cooked octopus as tender as it could ever be. 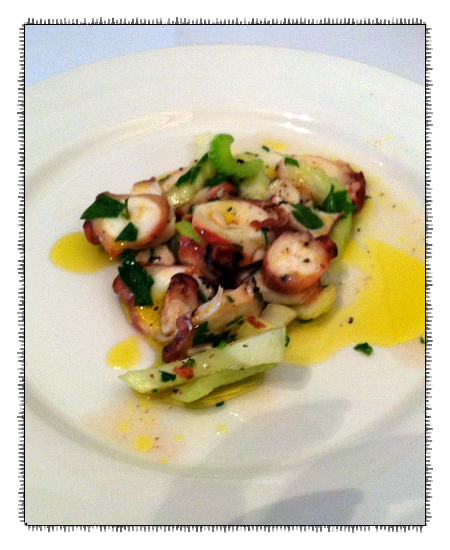 The flavour of celery came through loud and strong, crisp and clean, an excellent foil to the rich olive oil dressing. 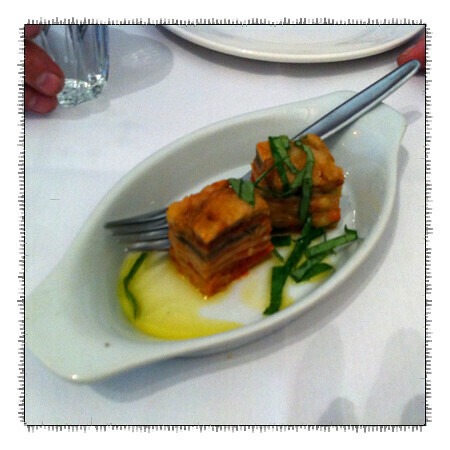 Two gorgeous cubes of eggplant parmigiana, served warm - quite a delicate presentation as the eggplant was finely sliced. Richly flavoured tomato sauce with fresh basil to cleanse. Pepperonata is a slow cooked dish of peppers, tomato and onion and this was a fantastic version of it, alongside tender roasted cauliflower florets. The beans were toasted in a mix of garlic and olive oil. 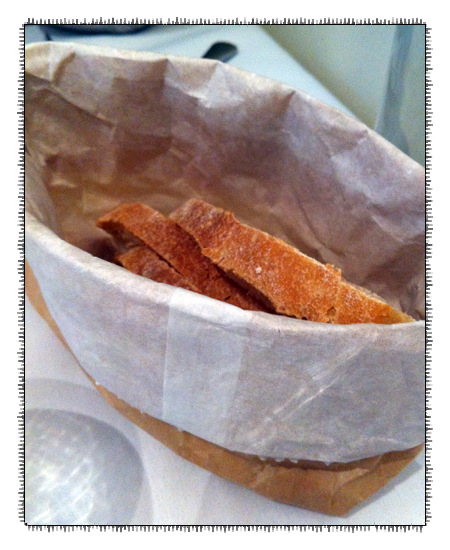 The bread does get replenished through the meal - I love the lined brown paper bag it comes in. And what a dish it was. 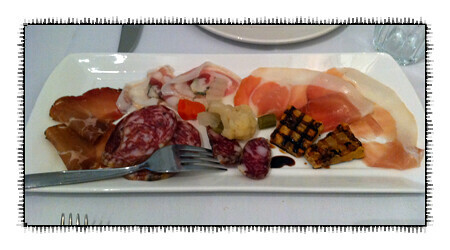 All the cured meats except the Culatello were made in house. The Pancetta has to be tasted to be believed, it would easily be the finest specimen I've ever tasted. It wasn't just that the pork meat was so soft and the pork felt just melted in the heat of your mouth, it was the burst of freshest that came from the herbs that had been rolled through the meat that made you just stop. 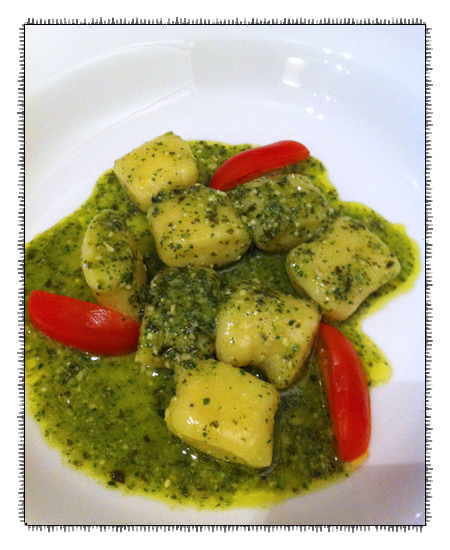 I've very fussy when it comes to Gnocchi and if you grew up eating the gnocchi my mother can make it is justified. Though these gnocchi are larger in size than I would be used to, I could pretty much tell just by their appearance that they were going to be good - this was confirmed as soon as the tines of my fork entered one of them - no resistance at all. Taste in the mouth, pure potato - absolute bliss. We ate these very slowly so to enjoy every mouthful. 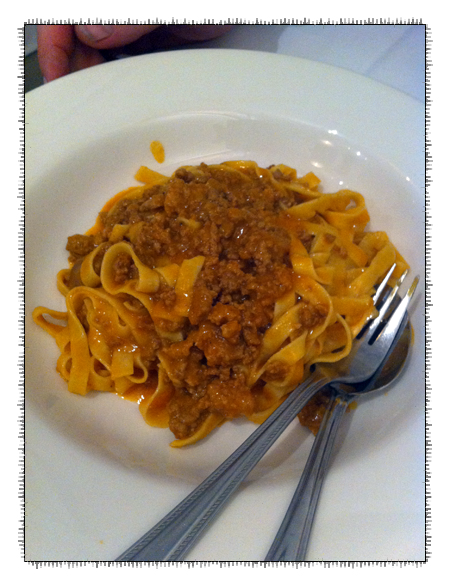 We also got a second pasta dish to share - well flavoured, rich ragu. 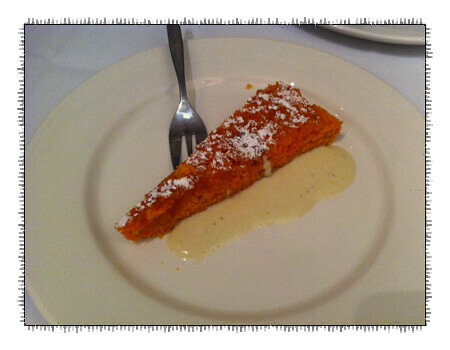 There was a lovely sweet backnote of browned butter to this dish. 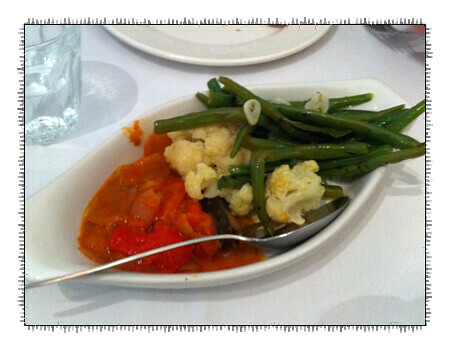 Just the presentation of this dish makes us happy as it is so typically Italian. 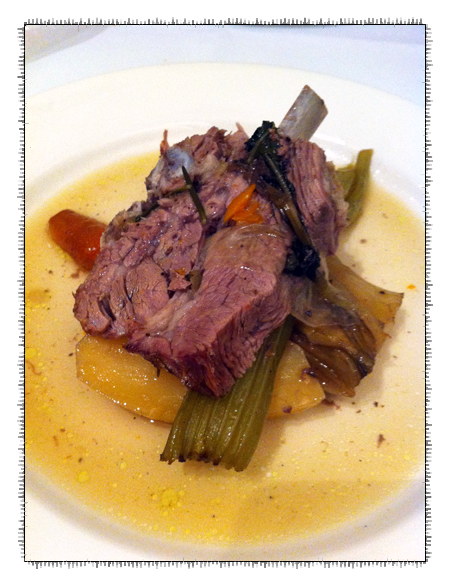 It is honest and simple - you have the meat, in this case wonderfully tender, slow cooked goat served with a little bit of fennel and some of the vegetables it had been braised with. 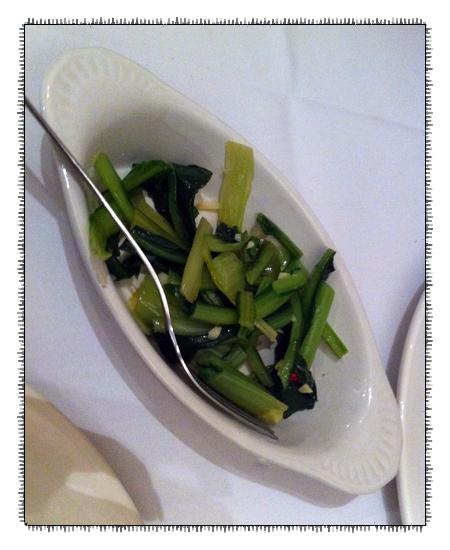 chicory sautéed with garlic and chilli. One again we were asked if we'd like some more and we might have said no if we hadn't seen the pork going out to other tables. 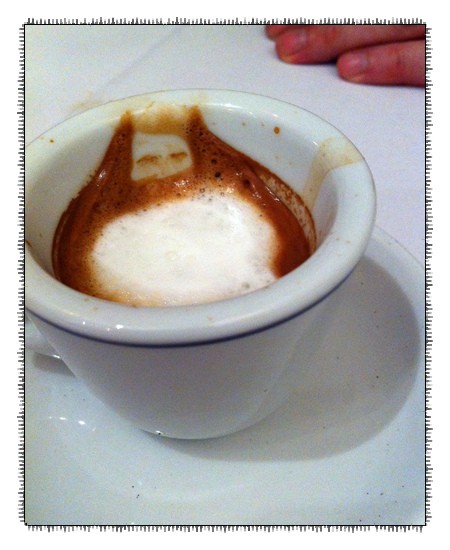 We didn't need to order it but we couldn't resist. 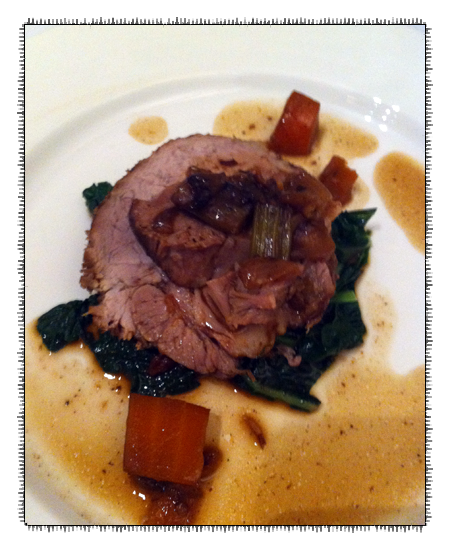 Tender pork served on sautéed cavolo nero served with its braising juices. First up, a scoop of Tiramisu. 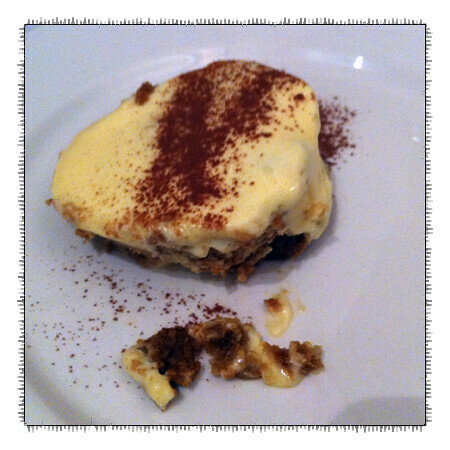 It's unfortunate that Tiramisu has fallen out of favour with the foodinistas because when you get one as good as this, it reminds you just how delicious it really is. The first thing that strikes me is here is a carrot cake that actually looks like it has carrots in it, the next thing is that it is served with an eggplant sauce - surprisingly, it tastes delicious! This is the first dish of the night that isn't a traditional Italian dish, it's the chef's own invention, though the way it is served is very traditional. To end the night, coffee of course! There's so many things to love about this place. For us, it's as close to dining in Italy as you can get without being in Italy. Yes the dining rooms are small and the chairs are not very comfortable - it's not perfect but its imperfections are typically Italian - the service can be organised chaos. The dishes come when they come. If you're the type that expects an entrée, a main and a dessert, then you're probably not going to like it. Similarly if you need to be in control of what you eat, then this isn't the place for you. Enjoy the ride - enjoy the spirit of the place, enjoy the heart. As a side note, we have been back again for dinner and it's been another lovely experience.